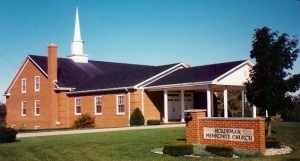 Holdeman Mennonite Church (Mennnonite Church USA), located one and one-fourth miles (2 kilometers) northwest of Wakarusa in Olive Township, Elkhart County, Indiana, is a member of the Indiana-Michigan Mennonite Conference. The first meetinghouse, a log building, was built in 1851 and was replaced in 1875 by a frame structure, which was remodeled in 1913 and again in 1951. During the early years all the Mennonites in the western part of the county were considered members of the Yellow Creek Church; regular Sunday services alternated between Yellow Creek and Holdeman. By 1875, however, the separation into two distinct congregational organizations had been well established. The congregation was host to the first regular session of the Mennonite General Conference in 1899. Ministers who had given longer periods of service to the congregation prior to 1950 included Jacob Freed, Jacob A. Beutler, Henry Weldy, and Silas Weldy. The membership in 1955 was 234; Simon Gingerich was pastor. In 2008 the membership was 200; the pastor was Danny Russell Jones. Centennial History of the Holdeman Mennonite Church. Wakarusa, Ind., 1951. Mennonite Historical Bulletin (January 1952). Conrad, Lloyd V. "Holdeman Mennonite Church (Wakarusa, Indiana, USA)." Global Anabaptist Mennonite Encyclopedia Online. 1954. Web. 20 Apr 2019. http://gameo.org/index.php?title=Holdeman_Mennonite_Church_(Wakarusa,_Indiana,_USA)&oldid=146971. Conrad, Lloyd V. (1954). Holdeman Mennonite Church (Wakarusa, Indiana, USA). Global Anabaptist Mennonite Encyclopedia Online. Retrieved 20 April 2019, from http://gameo.org/index.php?title=Holdeman_Mennonite_Church_(Wakarusa,_Indiana,_USA)&oldid=146971. Adapted by permission of Herald Press, Harrisonburg, Virginia, from Mennonite Encyclopedia, Vol. 2, p. 789. All rights reserved. This page was last modified on 18 January 2017, at 21:56.